After I saw the tool called the Ring Master I just had to see what this was all about. 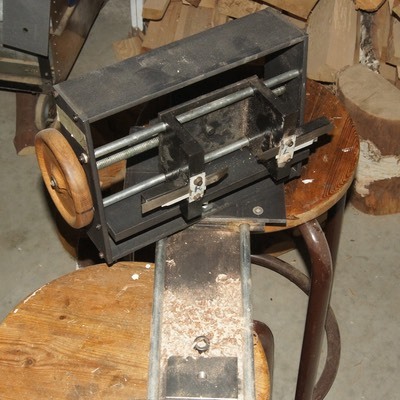 The easy part was getting a board ready to mount on the lathe. Problem #1. 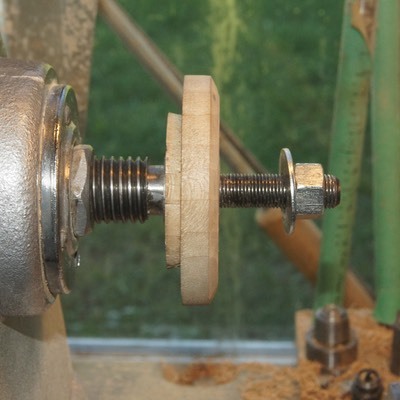 How do you mount a board on the lathe? So I tried the same idea as the Ring Master used. Most boards we can buy are 3/4" thick. I had a sample of a Pine shelf that was just under 12" wide, so I cut off a 12x12 piece, marked the center and bored a 1/2" hole.Now what? 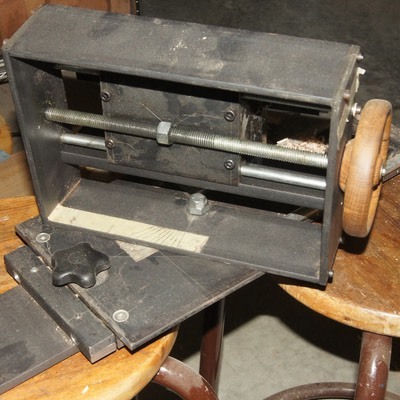 I had a Morse Taper for the Head stock, but the threaded shaft was too short to go through the board. 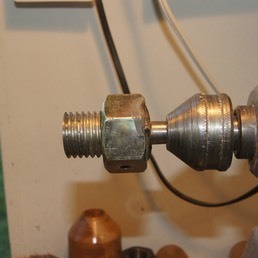 After a lot of messing around, I finally got a 2 1/2" long 1/2" bolt mounted in a Morse Taper. I had to also make a draw bar to hold this all in place. I will try a faceplate next time! Problem #2. I needed a Ring Master. I didn't have one so I began the task of making one. After several months of messing around I put together something that looked and operated like a Ring Master. The cutters were an issue but with the help of Grizzly Tools I came up with a nice set of cutters that work well. I was under the impression that you had to spin the board fast. All this does is create smoke and heat. The heat distroys the glue, so, slow the whole thing down and cut a nice smoke free ring. Problem #3. Cutting the rings and getting them to fit. 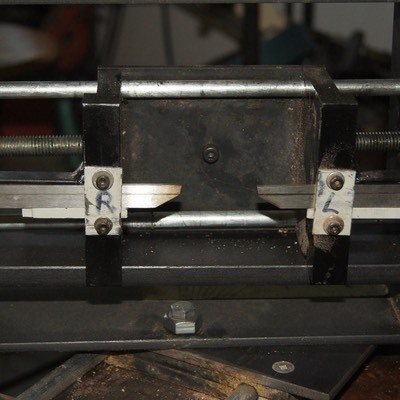 This is all dependent on the thickness of your board and the angle you cut your ring on. 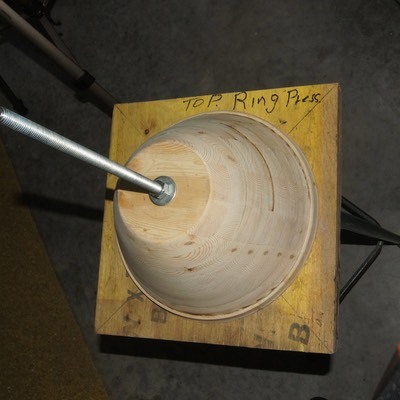 My best advice is to draw out a cross section of your board and pick the angle that will make the rings match and set your Ring Master/ saw or what ever you are using to cut your rings at this angle. The rings fit nice!!! 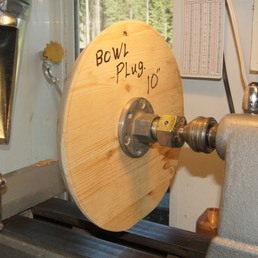 Remember, make the rings a bit thicker than what you want as a finished wall thickness on your finished bowl. Making the ring thick isn't a problem but making them too thin is a huge problem later on. Problem #4. Glueing the rings together. 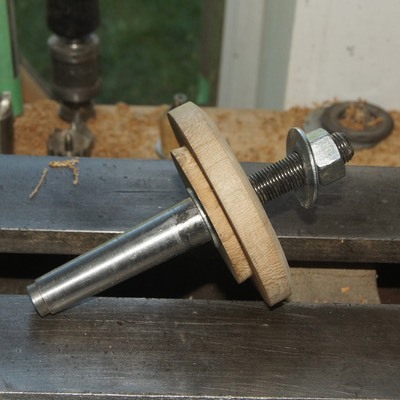 I made a Screw Press so I could put a bit of pressure on the rings. Found out soon on that you only glue one ring at a time. Trying to get the rings to stay in place is a a real challenge, so if you have to align the rings and try to keep things all straight all at the same time….. Hair pulling time!!! 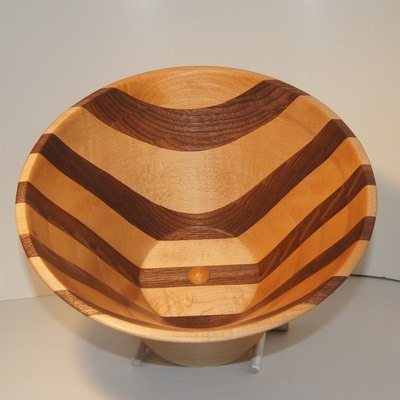 This is the last you will see of the Pine bowl, it ended up so thin you could see light through it and it wasn't round or true… It was a first attempt… and a huge learning project. I then glued up a board of Walnut and Maple strips and had another try at this whole thing. Problem #5. 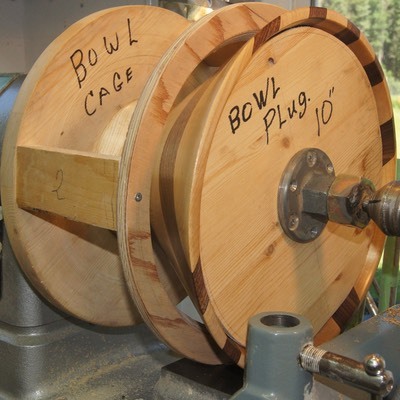 Now that you have all the rings glued up and the bottom with the 1/2" hole in it all put back in place we have to re-mount this thing back on the lathe so we can try and clean it up so it looks like a bowl. Unless you are a lucky guy this creation isn't round or straight. So I had to come up with something to support it by the Tail Stock so I could true up the outside. I made an add-on for my Live center. This let me put a plug into the inner lip of the bowl and believe it or not, it ran pretty good. You have to leave the mount on the bottom a bit loose so it can move around a bit because it sure isn't a prefect cone yet. Problem #6. OK, you have the outside of the bowl looking pretty good. So I sanded the outside and got a few coats of sealer onto it. Now what? If you take the plug out so you can see the inside, you sure can't spin it, it will fly apart due to it's wobble and not being centered any longer. I had to come up with a way of holding the outside of this thing round and centered so I could clean up the inside. 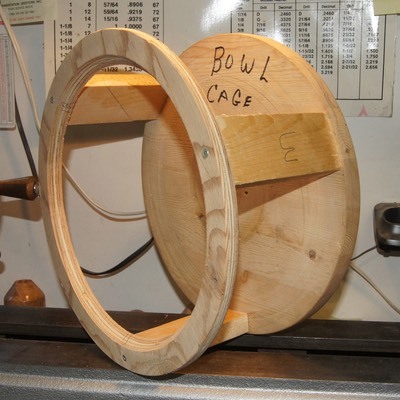 So I had to make a cage around the bowl that would give it good support and keep it centered. I had an extra piece of the shelf left over so I cut one more 12X12" disk out of it and mounted it on a 6" faceplate. 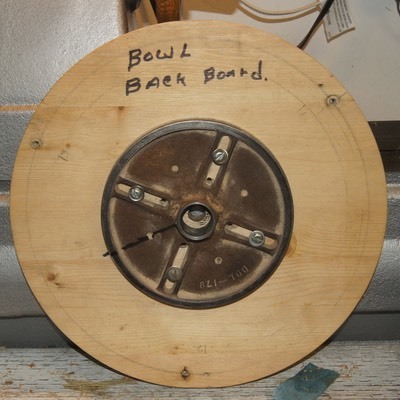 It ran pretty straight and true so I then had to mount the bowl bottom onto the is back board. 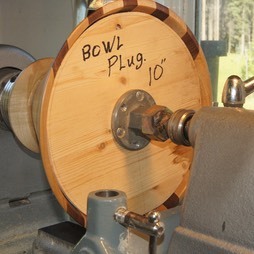 I used long screws that went through the faceplate and back board and into the bowl bottom. 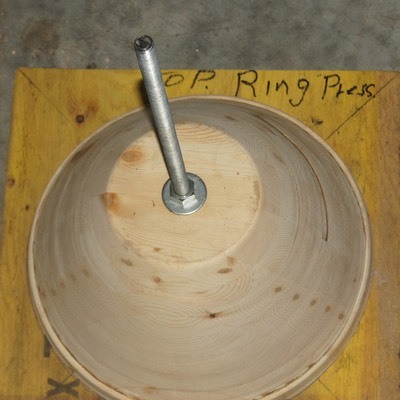 I then cut a ring out of plywood that fit the outer diameter of the outside of the bowl. I then put 3 sides that fit between the back board and the ring. My cage was complete. It held the bowl really well and ran pretty straight and true. I was able to cut the inside of the bowl with no problems. Sanded and sealed the inside. It looks like a bowl and I was amazed at how good it looked. This last pic. doesn't show things exactly because it was taken after I had put the base on, so the bowl is deeper than my cage but without the base, it will hold things very well. Problem #7. The bottom is full of holes!!! 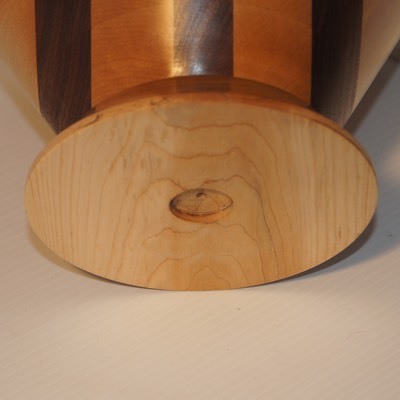 There is a 1/2" hole in the middle and a bunch of screw holes in the outside of the bottom. 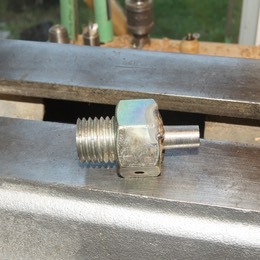 The inside looked pretty good, so I made a nice little plug for the 1/2" hole and the inside was done. The outside, not so easy. Due to the size of this bowl and the foot print of the bottom, it needed something for support. 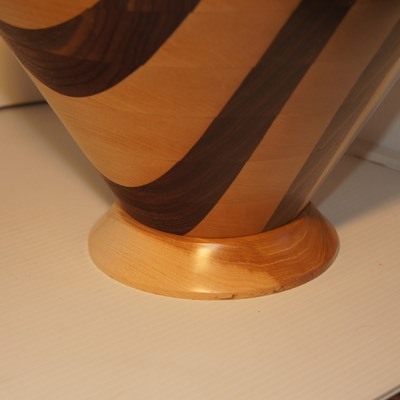 I made a nice foot/base for the bottom of the bowl. Glued it on and I was done. Oh not so fast, it didn't sit flat and straight. I had to true up the bottom of the bowl first. 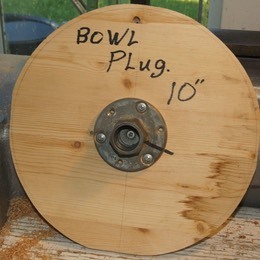 I have a large Longworth Bowl chuck so this wasn't a huge job. Now the new foot fits nice and the whole creation sits straight. Looks pretty good to. Conclusion: This is a lot of fun, but to make things much easier next time I will not use the bolt idea to hold the board. A small 4" faceplate will work much better. Use short sheet metal screws that don't penetrate the board and the inside will be clean and the little plug won't be necessary . I still like the idea of the base to give it better support. Give this a try, you end up with a huge bowl and very little wast. Sure much better than making a bowl this large out of solid stock and a huge pile of shavings. © Rocky Roost Wood Turning. -- All rights reserved. 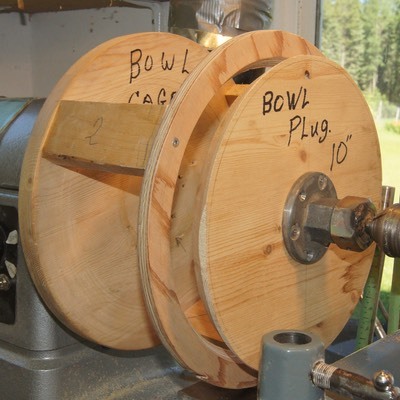 All information presented on this site is copyrighted by Rocky Roost Wood Turning except where otherwise noted. No portion of this site may be copied without express written consent. Other sites are invited to link to any aspect of this site provided that all content is presented in its original form and is not placed within another frame.